Ladies and Gentleman start your engines! Forza horizon is no doubt the best looking open road driving game on xbox 360. Stunning real life looking cars, beautiful environments and crisp sharp details. You even see animals in the game. 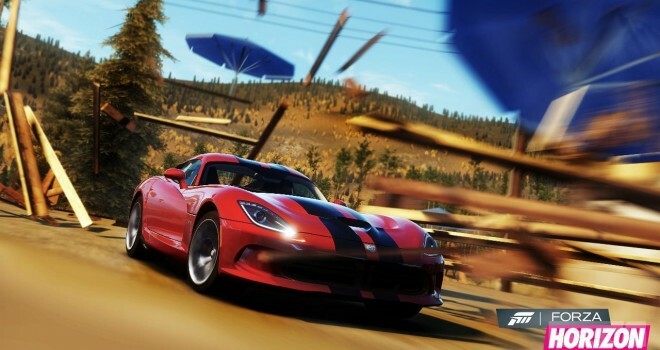 The game takes place in Colorado, where you compete and dominate your rivals to win the Horizon Festival Championships. From plains to mountains, ranch valleys, forests and narrow streets; Forza Horizon feels like alot of driving games combined together.The game mixes dna of Need for Speed , Dirt, Forza, and burnout all combined together to make one incredible action racing game.The weather effects are beautiful and stunning. Full day and night cycles, cars handle and sound like the real life counterparts. From the roaring engine of the dodge viper to the tuner exotic sound of a Nissan 370z you can tell the difference between the two cars sounds and handles different.Damage effects are stunning to look at, you also have the ability to damage some environments in the game.Great selection of cars and music there are fifty car manufactures in the game.Cockpit view is very sharp and detailed; from the cluster gauge needles moving to the dashboard and steering wheel. You also have the ability to rewind time like the other forza games for example: if you crash just rewind and the problem is fixed. Solid graphics no slow downs whatsoever.Blazing down the highway going two hundred miles and hour in a dodge viper feels very realistic,you can also get performance upgrades for your car and customize paint jobs.There are also pink slip races and sponsorship races that can reward you with a new ride,and you can discover old cars and fixs them up and sell them for extra cash.The kinect feature is great just say gps and it will navigate. Festival races are setup with different color wristbands also if you change the difficulty settings on your opponents you can earn more cash.There are several modes and events in Forza Horizon all of them are fun and competitve and entertaining. Mutliplayer is very good as well you can free roam, start a lobby, invite up to seven people and enjoy the open roads of Colorado. Co-op challenges lets you work together with your friends to accomplish road trips from one landmark to another.Closing from the offroad aspect of dirt,the customization and street races of need for speed, the realism of forza and crash physics of burnout.Forza Horizon is one truly amazing driving experience a must buy for driving fans.